Markham Works formerly Broad Oaks. The foundry and ironworks at Broad Oaks was originally a thriving business dependent on local coal and ironstone mined on site. It produced much of the plant required for colliery operations such as winding engines, washery plant and the 'nuts and bolts' required by local mining companies. 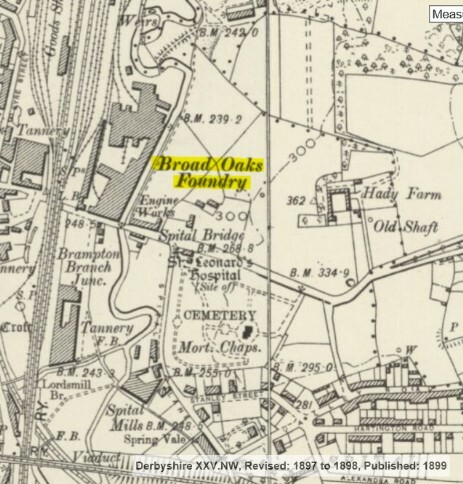 The name Broad Oaks was first used on an ironworks which was to be found at the bottom of Storforth Lane at Hasland which was later transferred to Chesterfield with the owner Mr. E. Eastwood residing at Hasland Hall, Hasland. The original company suffered hardship and went into liquidation as a result of the depression of the coal and iron trade in the 1880's. The following articles which appeared in the Derbyshire Times show the demise of the ironworks during the depression of the 1880's. 12th March 1886. A well attended extra ordinary meeting was held by Oliver & Co Iron founders to discuss the difficulties the firm were currently in due to the depression within the iron trade. The chairman Mr.E.Eastwood J.P. last week petitioned the high court for a winding up order for the company. 27th March 1886. The high court had heard the petition from the chairman Mr. Eastwood who was both a creditor and a shareholder of the company. The nominal capital was original £20,000 but was later increased to £80,000. The property consisted of a freehold plot of land with ironworks and built in railway sidings. 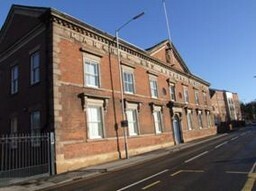 Also in Chesterfield was the Victoria Iron Foundry comprising of plant, materials, tools and stores. In 1888 after the death of his father, Charles Paxton Markham took over the Directorship of the Staveley Company (he chaired the meetings of the company as early as 1894 aged only 29). A man who would not suffer fools easily and like his father an anti-Trades Unionist he decided to purchase for himself the Broad Oaks Works in 1888 after the original company of William Oliver had gone into liquidation. 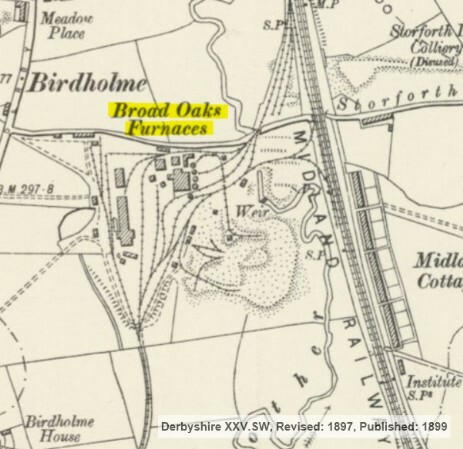 His far sighted gamble paid off and the new Markham Works produced, initially with 150 men raising later to 600 men produced and erected blast furnace and steel rolling mills, steam winding engines and colliery washery equipment for the British coalfield. Boasting that 1/5th of all British coal was 'wound over gear that was produced by his company'. He was also instrumental in the building of Spital and the demolishing of the 'Dog Kennel' slums on what is now Markham Road in Chesterfield. He was a well known benefactor and Philanthropist in the area and was a J.P and served as Mayor of Chesterfield. One peculiar sideline of the company was to be the sole agent of the Ford Motor Company and selling the Model 'T' touring car from the works in 1914 for the princely sum of £135, or the Runabout model for £125. Both 'Fully Equipped'. The company later passed into the hands of the Staveley company after Markham’s death in 1926. The area around the works was able to easily access the Silkstone or Blackshale coal and ironstone seams, these were at an easily mined depth from the surface and were exploited by several collieries throughout the nineteenth century, the remains of which are still there today. Broad Oaks colliery comprising of three shafts, two are coupled together underground by a 'level road', one shaft being at least 210 feet deep into the Silkstone seam. The third shaft appears to be an early one but one can presume this also will access the Silkstone seam. The collieries would I suppose have worked primarily the Blackshale ironstone Rake above the Silkstone seam for use at the iron works and of course use the coal to make coke for smelting. Also on the same site is Old Hady colliery this has three shafts into the Silkstone seam the bottom of one shaft is 270 feet deep. You can still see the 'bee hive' cover for this shaft. This area originally produced ironstone for the Griffin iron foundry of the Smiths in Chesterfield. 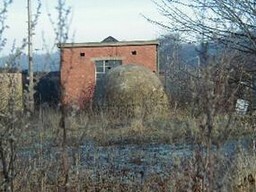 A single shaft exists at Hady Farm from an old colliery which is thought to be the site of Hady Hill Colliery SK 36/37 392709. About the area of Piccadilly Farm there are at least ten shafts recorded, the colliery is around SK 36/37 392714. (Worked primarily Ironstone the coal was a bonus).